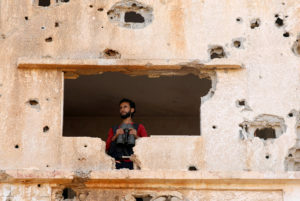 BEIRUT — Syrian rebels have agreed to surrender the southern city of Daraa, the first to revolt against President Bashar Assad in Arab Spring-inspired protests earlier this decade, activists said Thursday. Protests in Daraa in 2011 against the government’s mistreatment of teenage detainees ignited a national revolt against decades of authoritarian rule. Syria eventually descended into a full-blown civil war that has claimed the lives of some 400,000 people and displaced more than 5 million as refugees. Daraa governor Mohamad al-Hanous said government forces were in control of 80 percent of the city, according to the government-linked Central Military Media outlet, while Syrian state media reported late Wednesday that rebels in Daraa had agreed to surrender their heavy and medium weapons.